Valve's Gabe Newell is fond of the idea of remaking the original Half-Life with new content. On a recent episode of the SteamCast, Gabe Newell talked about what Valve would do with a remake of the original Half-Life, were one to ever happen. If it did, Valve wouldn't just shine up the content first released back in 1998. When asked if a Half-Life remake would include the game's original cut content, Newell said: "No, I think we'd just invent new stuff. I mean, I think we're much better game designers and developers than we were back then." Newell added that he thought it'd be "fun" to take on such a project and that there would be "an unlimited amount of opportunities" for what could be altered or changed. 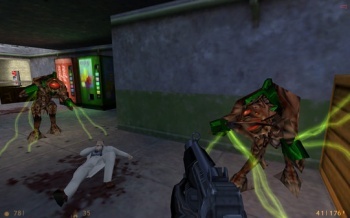 However, Valve project manager Erik Johnson said that the Stukabat, a bat-like alien found in Half-Life's files but removed from the game, would definitely remain on the cutting room floor. Sadly, or happily depending on your view, a remake of Half-Life in this vein will probably never happen. Gabe Newell finished his thought by saying: "It's fun to think about that stuff but almost always you're better moving forward than you are looking back," referring to Valve's desire to move onto new projects rather than taking steps into the past. I'll take Portal 2 over a remade Half-Life any day.